For going on five years now, progressive bluegrass guitarist Larry Keel has been spearheading three-day and four-night “Bass n’ Grass” and “Trout n’ Tunes” events combining the guitar hero’s foremost passions: fishing and picking. Held at live-water locations like Goose Lake in Georgia and the Elk River in West Virginia, these affairs feature a slew of acclaimed bluegrass musicians and master fishermen—including Steve McMurry, Jeff Mosier, David Blackmon, Gove Scrivenor, and award-winning bass fisherman/banjoist, Will Lee—and provide participants with a long weekend of instruction in bluegrass music and fresh-water bass or trout fishing. “We wanted an atmosphere that would lead to a real intimate and laid back experience,” says Keel, who is 48 years old and lives in Lexington, Virginia. “Music-wise we have workshops, Q&A forums, nightly shows, constant jam-sessions, and tons of hands-on instruction.” Meanwhile, out by the water, there are seminars on fishing techniques—how to tie flies, what kind of bait to use, how to understand various fish habitats, and so on. With fewer than 150 attendees, the events are designed to create close interactions between participants and staff. Hoping to learn more about the artist’s connection to fishing, I sat down with Larry and his wife, the bassist Jenny Keel. The Slide' of Henry's Fork of the Snake River, near Ashton Idaho Fish: a whopping 10 pound brown trout. Courtesy of Larry Keel. Eric Wallace: We know fishing plays a huge role in your life. Could you tell us how you got into it in the first place? What role did the activity play in your childhood? Larry Keel: I grew up in the countryside of northern Virginia in Fauquier County. There were three ponds just steps away from our house, so I fished every day of the summer from a really early age, just because it was so convenient and close and safe. Mom didn’t mind a bit. I caught fish all the time, and we’d eat what I brought home! In the evenings, I’d help my folks with the garden. Those’re some super-good memories of what was, in my opinion, some really great living. Was there a connection for you between fishing and picking early on, or was that something that happened later? By the age of seven I was already fishing and gardening. Then, for my seventh birthday, my brother bought me a guitar and encouraged me to join in playing music with him and my father, who played bluegrass guitar and banjo. I burned to learn how to play like them and excel on my instrument. So, from then on, I was fishin’ and pickin’ all the time. And things haven’t changed much since. What role does fishing play in your creativity? Fishing always calms and centers me. For me, water is a main source of power—like, spiritual power. I try to gather that power to be used when needed through the course of living and creating. Is there a piece of go-to gear you can’t live without? For me, the ‘Wacky Rig’ is always the freshwater fish-finder. Otherwise, there are way too many flies and rigs in the trout-fishing and saltwater worlds to pinpoint any one piece of gear. But I like returning to one approach for fishing anytime and anywhere: To catch a fish, you must learn to think like a fish. 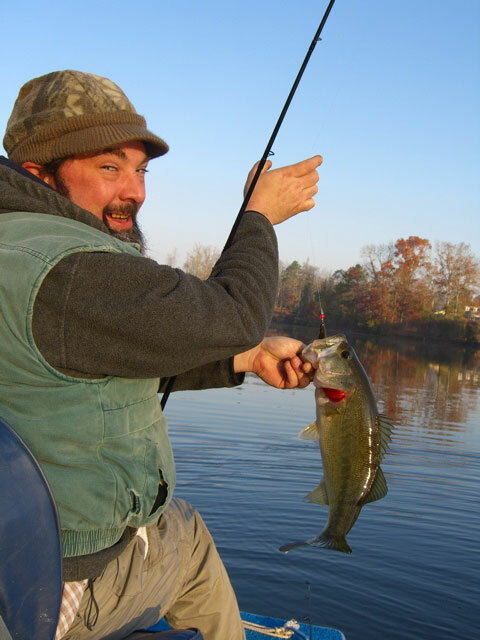 As a musician-fisherman, you’ve indulged many a fishing adventure during your travels across the country and beyond. What’s been the best so far? I really have to say that, whenever I fish, no matter where it is, it’s a special and soul-enriching experience for me. However, some particularly epic settings and exciting catches were on the Chilkoot River near Haines, Alaska, the Henry’s Fork of the Snake River in southern Idaho, and on the Middle Fork of the Salmon River in central Idaho. When things get stressed on the road, if you could teleport anywhere in the U.S. and find yourself with a rod and reel in hand casting into some pristine waters, where would that be? The Outer Banks of North Carolina. Unless there’s a hurricane or a crazy nor’-easter hitting the island, I find it’s very serene, very mystical, very inspiring. And you never know what you’re going to catch, so. You’re something of an environmentalist. Could you talk briefly about your relationship to the environment and conservation? Since mankind can’t really do without it here on Planet Earth, I’m for Nature first. It’s just common sense that we need to pay close attention to our natural world, take care of it, and be stewards of it instead of reckless users of it—then it will continue to provide good stuff for us. You know, inconsequential things like clean air and water! And I think preserving our majestic National Parks and creating more green spaces for all to access are crucial to a healthy, happy society. What relationship do you see fishing having to environmentalism? I absolutely see a connection between responsible fishing and environmentalism. It goes hand in hand with what I talked about in the previous question: It’s just common sense that we have an intrinsic relationship with our natural world. Like a family-member, it’s something that takes care of you, and out of love and respect you take care of it back. A fisherman shouldn’t litter, should practice catch-and-release when those are the regulations, and should take an interest in the overall health of the water and ecosystem they’re fishing. Maybe tell us a favorite tale? We all wound up in this little john boat, with me in the back doing the captaining, Mark in the middle and Andy up front. Andy was particularly excited about the fishing and we were all reeling in some beauties. Meanwhile, he kept casting pretty wildly—back-casting a little too long and a little too powerfully to be in such close quarters with two other anglers on a small boat. Well, one of those back-casts landed smack in the back of my head, just below the band of my hat. He had a huge treble-hook style lure on his line with nasty barbs that dug deep into the back of my head. It was totally embedded in my scalp, almost to the bone. And you can’t just pull those barbs out. They’re designed to grab hold on the inside of whatever they attach to, just so you can’t pull ‘em out and lose your catch. So off we all went to a local urgent care medical facility, me with a giant hard-bait lure in the back of my head, and the rest of the band and crew waiting around for me to have it removed in a minor surgical operation which was topped off with a fresh tetanus shot. Once everything was done, the doctor presented the lure to me in a small specimen jar, which I promptly gave to Andy as a souvenir and a reminder to check his wild casting when in a boat with other people! Funny thing is, he still has that bottle. I saw it just a couple of months ago in his music room at his home in Boulder, Colorado. Goose Lake, a private lake in Fort Valley, Georgia. Courtesy of Larry Keel. What are you up to these days musically? I’m ultra-fired-up about the music we’re putting out with my current band, The Larry Keel Experience, which includes myself on guitar and vocals, my wife Jenny on upright-bass and vocals, and our newest LKE member, the ultra-accomplished Jared Pool on mandolin and vocals. Our unit is reaching new heights in creative, amplified Americana music, and I’m writing tons of new songs right now, which I’m planning to record this year…. The new music is sophisticated and experimental, playful, dark, exhilarating. Mostly it’s original music, but we’ve put together some surprising and rowdy cover tunes. But really, I can’t ever get too far away from my own Appalachian roots, since my family for generations come from the deep southwest corner of Virginia and I was raised with that mountain-culture strongly influencing everything my family is about. It’s in my personality. No matter where I live or travel, it will always be a part of my music. Jenny, you’ve become something of a fisher yourself. Can you tell me what the activity has meant for you and Larry’s relationship? With Larry showing me how to put the lure on the line and cast, it was a blast to catch my first fish. I caught a little rock-bass on the Maury River in Rockbridge County, Virginia, and ever since then we’ve fished together all over the country, in all kinds of settings... Fishing with Larry feels like all the things we do together—it’s just wonderful to share in an experience with my best friend. And I’d like to add that, to be able to play music with him is an incredibly powerful experience. When we’re really into the music we share in a super-spiritual, creative exploration of one of the most soulful and artistic parts of ourselves. He’s the best teacher and encourager I know! Jenny and Larry Keel. Courtesy Larry Keel. Being on the road with a band is notoriously hard. What role, if any, has fishing played in easing that hardship? Finding opportunities to fish while we’re on the road is such a great perk of travel. In all our years on the road and with all the musicians who’ve been in our group over the years, there’s not one among them who hasn’t thoroughly enjoyed the stops where we had a chance to wet a line. We’ve been so fortunate to know wonderful hosts all across the country, who’ve invited the whole band to spend time on incredible live-water properties from lakes to rivers, broad streams and ponds, letting us fish and enjoy nature on our days off between shows. It always provides a ‘re-set’ for everyone, giving us all a chance to relax and learn more about each other in a totally different context than the stage, studio, or van. Being near water, it just makes everyone feel revitalized. And if you connect with a fish, what a feeling! Eric J. Wallace is a freelance writer. Moon River Foods and a handful of fishers are trying to fight the Mississippi's Asian carp population—but can they turn enough of a profit to make fishing carp sustainable? Once one of its most valuable resources, Maryland's oyster population almost disappeared—before suddenly jumping three years ago and reviving a struggling industry. The Jordan Lake Rules were enacted in 2009—but why does North Carolina's Haw River keep getting more polluted?